CBI - China: Day 75 of 154 of the Japanese Invasion of Manchuria. Germany: Kurt von Schleicher replaces Franz von Papen as Chancellor, but instability increases. Spain: Day 138 of 985 of the Spanish Civil War. Spain: Day 503 of 985 of the Spanish Civil War. CBI - China: Day 148 of 2,987 of the 2nd Sino-Japanese War. Spain: Day 868 of 985 of the Spanish Civil War. CBI - China: Day 513 of 2,987 of the 2nd Sino-Japanese War. Day 51 of 81 of Japan's Operation GUANGDONG. Finland: Day 2 of 105 of the Russo-Finnish War. Assuming a quick victory, the USSR creates a puppet Finnish government in Moscow. In the Baltic Sea, Finnish coastal guns damage the Russian cruiser KIROV and one of its screening destroyers. CBI - China: Day 878 of 2,987 of the 2nd Sino-Japanese War. Day 17 of 381 of the Battle of South Guangxi. Atlantic: The Italian submarine ARGO torpedoes Royal Canadian Navy destroyer SAGUENAY, killing 21, but not sinking the ship. UK: McGovern's ILP peace amendment is rejected by House of Commons, 341 votes to 4. ETO - UK: Day 87 of 258 of the Blitz. East Africa: Day 175 of 537 of Italy's East African campaign in the lands south of Egypt. CBI - China: Day 1,244 of 2,987 of the 2nd Sino-Japanese War. CBI - Thailand: Day 62 of 221 of the Franco-Thai War (Vichy France vs Thailand). PTO - Japan: US-Japanese talks continue, Roosevelt curtails holiday. Japan fixes the date of its attack against Pearl Harbor as the 7th December 1941. Russian Front - Finland: Day 163 of 164 of the Battle of Hanko. The Soviets will be forced off their leased naval base. Russian Front: Day 163 of 167 of Germany's Operation BARBAROSSA. Russian Front - North: Day 85 of 872 of the Siege of Leningrad. Russian Front - Center: Day 61 of 98 of the Battle of Moscow. Russians counterattack at Tula, Russia (120 miles south of Moscow). Russian Front - South: Day 33 of 248 of the Siege of Sevastopol, Crimean Peninsula. MTO - Libya: Day 236 of 256 of the Siege of Tobruk. New Zealand troops in Sidi Rezegh suffer heavy casualties by German Panzers. CBI - China: Day 1,609 of 2,987 of the 2nd Sino-Japanese War. CBI - UK: State of Emergency is declared in Malaya and Hong Kong is put on stand by. USA: Coffee joins the list of rationed items in the US despite record coffee production in Latin American countries. 3) demands placed on shipping necessitated that many products take a back seat to others. 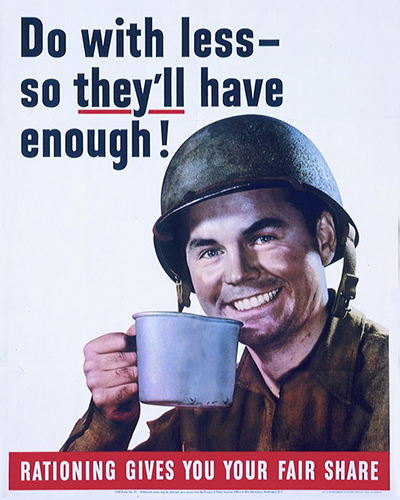 The growing demand for coffee beans from both military and civilian sources, and the demands placed on shipping, which was needed for other purposes, required the limiting of its availability. Coffee rationing was accompanied by the things that went with it: sugar and milk. At first, limiting the use of certain products was voluntary. Patriotism and the desire to aid the war effort were enough in the early days of the war. But as US shipping became increasingly vulnerable to German U-boat attacks, rationing became essential, starting with gasoline and moving on to include about one-third of all food items commonly consumed by civilians. Britain learned the lessons of rationing well during the first World War and were fully prepared with an efficient rationing program long before the outbreak of WWII. As a result, their people were never completely deprived of basic resources. Germany on the other hand, anticipating quick victories and a very short war, made no preparations for rationing at all. As the war dragged on and virtually everything was diverted to the military, German civilians were left high and dry and suffered greatly. Russian Front - North: Day 450 of 872 of the Siege of Leningrad. Russian Front - North: Day 13 of 59 of the Battle of Velikiye Luki, near Leningrad. This stalemate does help ease the siege a little, but mostly it keeps German troops from being sent to other fronts. Russian Front - North: Day 211 of 658 of the Siege of the Kholm Pocket, USSR lays siege to the Kholm Pocket but the Germans hold out for a about a year and a half. Russian Front - Center: Day 8 of 21 of the Battle of Sychevka, Russia. Russian Front - Center: Day 7 of 26 of the 2nd Battle of Rzhev-Sychevka, Russia, launched by the Soviets as Operation MARS. Russian Front - Center: Day 7 of 22 of the Battle of Belyi, Russia. Russian Front - Center: Day 7 of 17 of the Battle of Luchesa (Vitebsk), Russia. Russian Front - Center: Day 7 of 29 of the Battle of Molodoi Tud River, Russia. Russian Front - South: Day 102 of 165 of the Battle of Stalingrad, bloodiest battle in human history. MTO - Tunisia: Day 15 of 178 of the Battle of Tunisia. A German counterattack is launched toward Tebourba inflicting heavy tank losses on the UK's BLADE Force which was threatening to attack Tunis. US 9th and 12th Air Forces provide air support. CBI - China: Day 1,974 of 2,987 of the 2nd Sino-Japanese War. PTO - Alaska: Day 178 of 435 of the Battle of Kiska, Aleutian Islands. The US and Canada will defeat the Japanese invaders. PTO - Malaya: Day 286 of 357 of the Battle of Timor Island, a long guerrilla war ending in Japanese victory. PTO - New Guinea: Day 13 of 66 of the Battle of Buna-Gona. The Australian troops take Gona. PTO - Solomon Islands: Day 117 of 187 of the Battle of Guadalcanal. ETO - Germany: US 8th Air Force B-17s and B-24s attack industrial targets at Solingen. Russian Front - North: Day 815 of 872 of the Siege of Leningrad. Russian Front - North: Day 576 of 658 of the Siege of the Kholm Pocket. USSR lays siege to the Kholm Pocket but the Germans hold out for a about a year and a half. Russian Front - South: Day 100 of 122 of the Battle of the Lower Dnieper River, USSR. Soviet troops isolate the Germans in Crimea and control the northern half of the Dnieper bend. MTO - Italy: The British 10th Corps opens the door for the US 5th Army's offensive on the Garigliano. The US and Royal Air Forces provides air support for the ground troops. CBI - China: Day 2,339 of 2,987 of the 2nd Sino-Japanese War. Day 30 of 49 of the Battle of West Changde. PTO - New Guinea: Day 74 of 219 of the Battle of Shaggy Ridge. The Australians continue chasing the retreating Japanese toward Wareo. PTO - New Guinea: Day 71 of 162 of the Battle of the Huon Peninsula. PTO - Solomon Islands: Day 31 of 295 of the Battle of the Bougainville Islands. Atlantic: Princess Elizabeth launches HMS VANGUARD, the last and biggest battleship ever built in Britain. ETO - France: Day 123 of 284 of the Battle of Brittany. ETO - France: Day 78 of 236 of the Siege of Dunkirk. ETO - Germany: Day 74 of 145 of the Battle of Hürtgen Forest. Russian Front - Finland: Day 78 of 223 of the Lapland War. Finland and Russia have joined forces to kick the Germans out of Finland's most northern province. Russian Front - Center: Day 48 of 206 of the Battle of the Courland Pocket in Latvia. Russian Front - Center: Day 41 of 99 of the Siege of Memel, a border town of Lithuania and East Prussia. Russian Front - South: Day 34 of 108 of the Battle of Budapest, Hungary. CBI - Burma: Day 245 of 302 of the Chinese Salween Offensive. CBI - Burma: Day 18 of 31 of the Battle of Bhamo. CBI - China: Day 2,705 of 2,987 of the 2nd Sino-Japanese War. Day 229 of 259 of Japan's Operation ICHI-GO. PTO - New Guinea: Day 340 of 597 of the Battle of New Britain. PTO - New Guinea: Day 224 of 481 of the Battle of Western New Guinea. PTO - Philippines: Day 43 of 299 of the 2nd Battle of the Philippines, aka the Liberation of the Philippines or the Philippines Campaign. PTO - Philippines: Day 43 of 73 of the Battle of Leyte. PTO - Philippines: Day 21 of 41 of the Naval Battle of Ormoc Bay. Germany: 76 German industrialists who helped Hitler are arrested.